Several of us locals met at Petra’s, Lorna, Sheila, Kay, Donna, Gerhard (recently returned from several weeks in Europe), John, and myself (Roger) and proceeded to meet the others, Ken and Anne, Brian and Janet, Dave and Donna, an Marion S, at the White Rock pier. 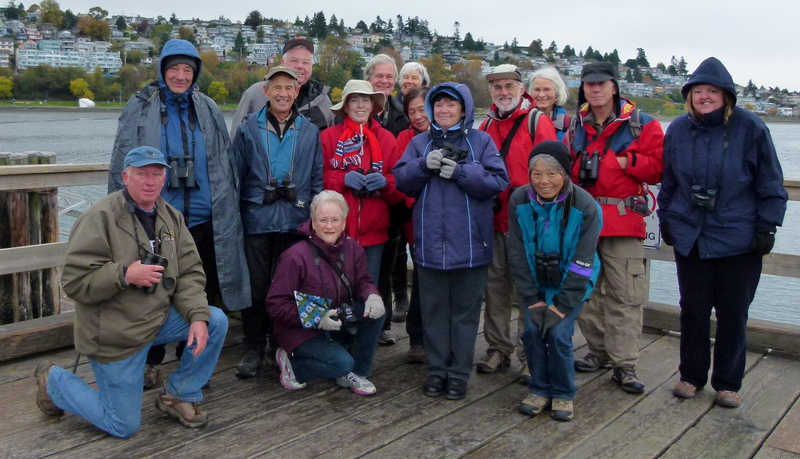 Considering the weather which was unexpectedly cold, overcast, breezy and with a light sprinkle of rain, I think we had a pretty good showing of hardy birders! The tide was quite low and one could have walked on the sand almost to the end of the pier. However, we still had a good number of bird species which included a large mixed flock of scoters. The most obvious were the Surf Scoters but when the flock was spooked by an eagle flying over it became apparent that the majority were White-winged. Although we searched carefully there were no Blacks mixed in with the others. Good close-up looks were had of three grebe species with a few Red-necked, many Horned and Westerns. There were several Common Loons, some seen eating small fish, and one Red-throated Loon off the outside of the rock jetty. A pair of Long-tailed Ducks flew by and the remaining duck species included American Wigeon, a few Greater Scaup and the odd Mallard. Two American Bald Eagles were on a light standard and, when one of them turned it’s head the light behind gave an eerie halo-like effect of which I hope one of us has a photo to display. All of the cormorants were Double-crested, and the gulls Glaucous-winged. After the group photo and with hypothermia setting in, and our free parking time (10:00 am) running out, we decided to check out Blackie Spit. There it was somewhat warmer and less breeze although there was still a bit of sprinkle. Off shore we sighted many more Common Loons, and Red-necked Grebes. Along the shore were more Mallards and Wigeon. Brian managed to spot a Marbled Godwit almost invisible with the sand background. Moving around to the protected area on the east side of the spit we found four more Marbled Godwits, a Long-billed Curlew, several Dowitchers (no one was willing to take a stand on which species). We had one Greater Yellowlegs in the swampy area and ducks along swamp and shoreline included large numbers of American Wigeon, Pintail, some Green-winged Teal, and Mallards. In the shrubbery and trees in the fields we picked up a large flock of Pine Siskins with American Goldfinches mixed in, some Purple Finches (Janet knows how to distinguish them from House Finches…even the females! ), Northern Flickers, Song Sparrows, Dark-eyed Juncos, and a possible Cooper’s Hawk (went by too quickly to get a good look). The parking lot had the usual group of Ring-billed gulls. The signal to terminate the trip was Kay jogging around the park to fend off hypothermia. She suggested going for sustenance at the “Wired Monk” and, since there was no indication that Lorna was going to distribute peanut butter sandwiches (this only seems to happen when Tom is present…we all say “Hi” Tom), off we went for hot Thai Rice soup. Next week we will “go local” and probably end up at Reifel Island. Richard Swanston has been seeing a Rock Sandpiper at the compensation lagoon along the ferry jetty which would be a suitable objective. As usual, let’s meet at Petra’s at 7:30 am for an 8:00 am departure (set your alarm, Kay). And, Lorna, please keep on with the “Bird Alerts”! This entry was posted in *DNCB, Blackie Spit, Bobcat, White Rock Pier. Bookmark the permalink.